The battle of good against evil is fought in the magical world of Narnia, in the most enchanting fantasy novels ever written. This volume brings together the first three books of the timeless fantasy series. New cover and new type treatment! The battle of good against evil is fought in the magical world of Narnia, in the most enchanting fantasy novels ever written. This volume brings together the first three books of the timeless fantasy series. New cover and new type treatment! 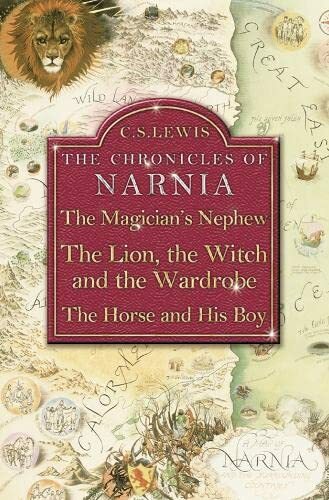 The Magician's Nephew opens the doorway to the magical land of Narnia for the first time...In The Lion, the Witch and the Wardrobe, Peter, Edmund, Susan and Lucy stumble upon the world of Narnia. Here, Winter and the White Witch are the greatest threats and the children must join forces with the great lion, Aslan, to battle against the evil enchantment. In The Horse and His Boy, Shasta, the slave boy, meets Bree, a talking horse, and together they flee on a wild and dangerous journey through strange cities, eerie tombs and harsh deserts - in search of Narnia, where there is freedom and safety.